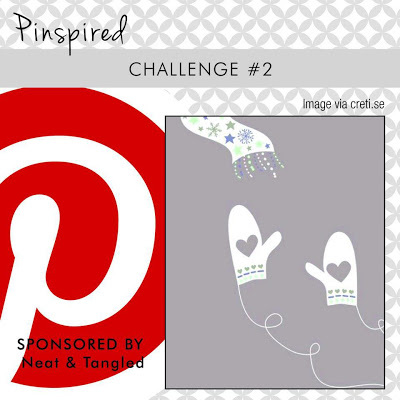 Lately I stumbled upon another new challenge blog called Muse Challenge. I was even more intrigued when I saw this video of my former CAS-ual Fridays team mate Suzanne (who is the latest Muse). I just adore Suzanne and call her "my little friend"! Do check out her lovely blog The Card Yard if you haven't! She has a sweet and elegant style with a CAS vibe! After seeing the video and Suzanne's gorgeous card (XOXO), I was inspired! What was I inspired by? I was also eager to use my new toys from Simon Says Stamps (Fresh Daisies Craft Dies and Folded Banner Craft Die). And of course, I want to use Leafy Vines for the chalkboard effect. The sentiment is from SRM Stickers. It works seamlessly with the diecut banner! The Daisies were first sponged with Distress Inks. And then I brushed the daisies with Pearlized mixture ( Mandarin Perfect Pearl and water). Ding---> Not into coloring? 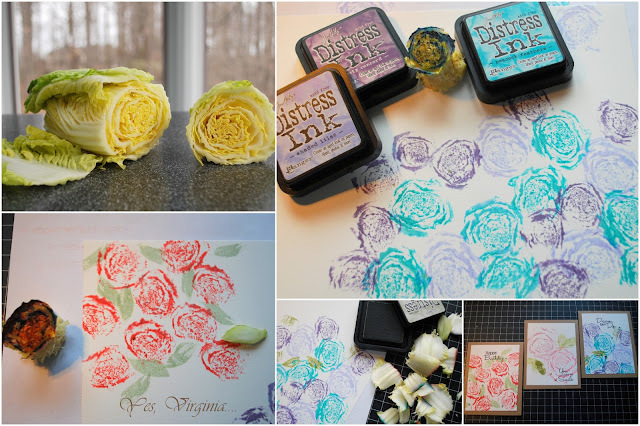 You can always use distress inks! Just use part of a sponge and start dabbing away...mixing colors is always fun. Add some shine--voila! 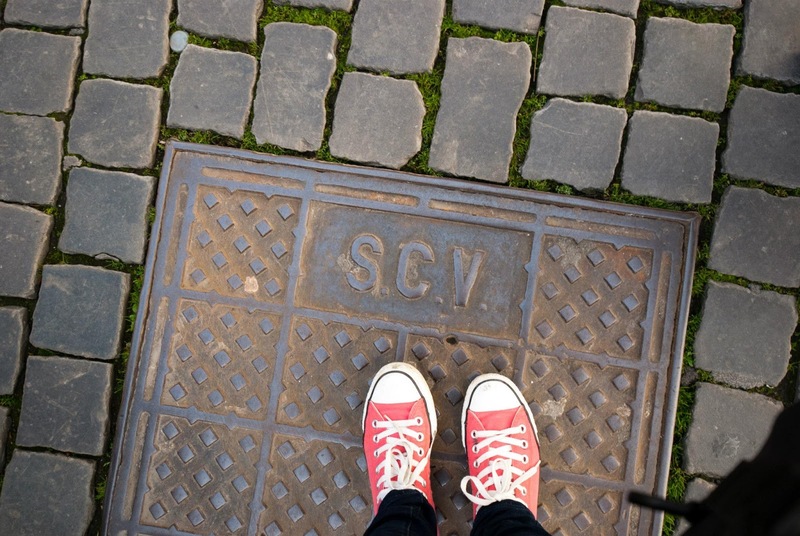 If you miss seeing my travel post to Rome, check it out here! Casual Elegance from CAS-ual Fridays Stamps! Now onto the NEW stamps from CAS-ual Fridays Stamps! You can find this stamp set "Casual Elegance" at the store here. 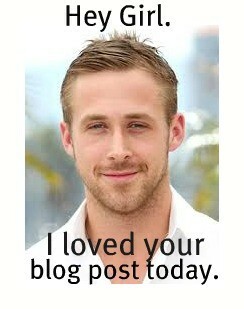 I will appreciate if you can go here and heave me some blog love! 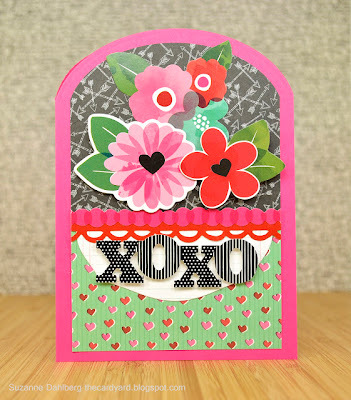 Ding---> have you tried stamping on pattern paper? Basically you do not have to worry about the background and it gives your stamped design an extra wow factor! Try it if you haven't! And while you are still here, check out my Roman Holiday! Hello! Are you ready to continue traveling with me? We are in part 3 of my Mediterranean cruise! And yes, all roads lead to...yup, you guessed it! Rome! 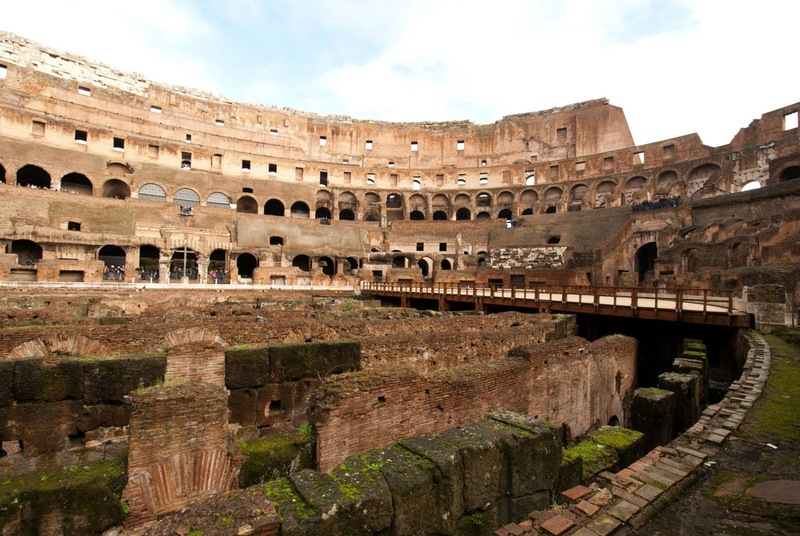 And today's post is all about Rome and the Colosseum. 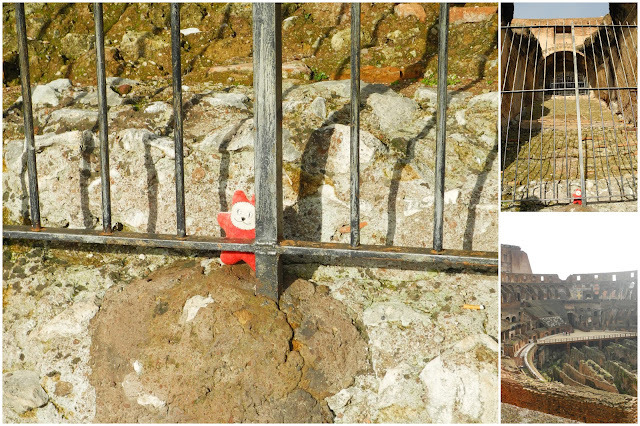 These are the photos that were taken just outside the Colosseum. We arrived in Rome on Dec. 27, 2012. Christmas was just over. Rome, the Eternal City, is just as glorious and chaotic as it ever was! 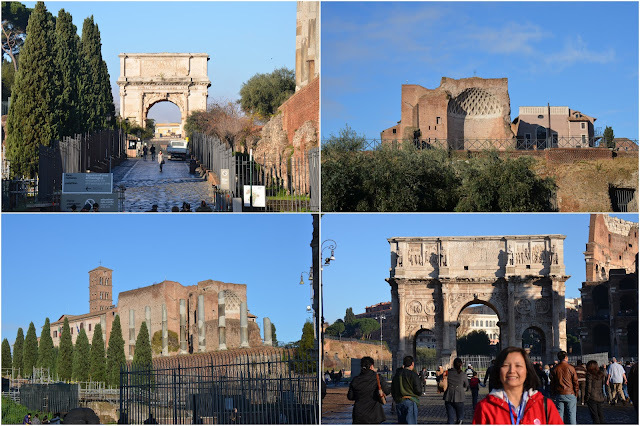 We had only ONE day to see the sights....it was hardly enough, but at least I got a taste of Rome! After an hour and half bus ride from our Port of Call (Civitavecchia, known as Port of Rome), we reached our first stop! 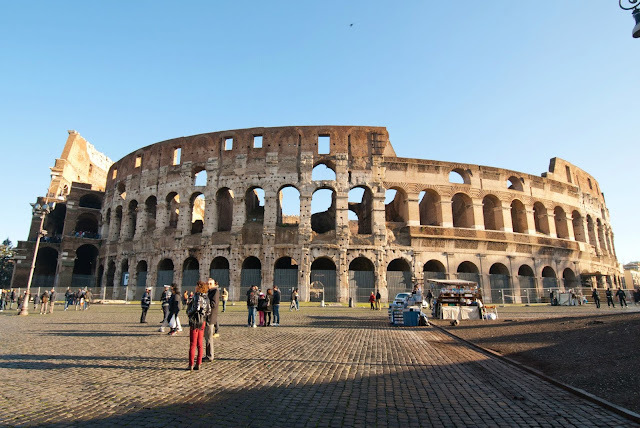 The Colosseum, or the Coliseum, is an elliptical amphitheatre in the centre of the city of Rome, Italy, the largest ever built in the Roman Empire, built of concrete and stone. It is considered one of the greatest works of Roman architecture and Roman engineering. It was amazing at first sight...there it is! 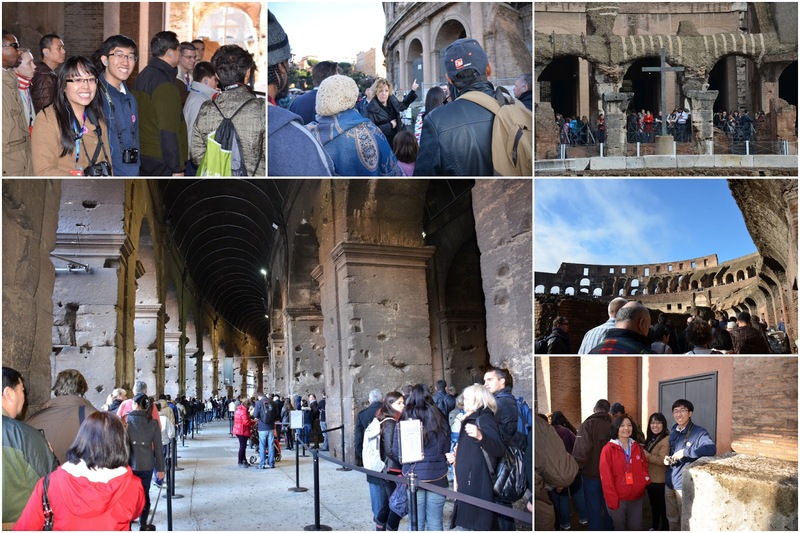 Our Italian tour guide (see the following photo-top middle) did a detailed introduction to this amazing structure. And being in Rome, we were surrounded by crowds and crowds of tourists. I was particularity vigilant with my purse as Rome is also notorious for pick-pocketing! The street vendors often play some silly tricks to catch your attention and then take your wallet in the mean time....I actually saw MANY suspicious street people "in action". However, must do what the Roman tourists do--Stay calm and tour on. Once we got inside, we saw these. The steps to the upper level were big and steep....I felt that that I was in the Romans' footsteps, so to speak. It was later reused for such purposes as housing, workshops, quarters for a religious order, a fortress, a quarry, and a Christian shrine. Oh....no!!!! It looks like my Alexia was all caged up and prepared to face the Gladiator!!! Thankfully the Lu family came to the rescue! It was VERY hard to get this photo of our family because tourists were everywhere! After a few more photos and walking-about, we were bused off to an Italian lunch! Love the pasta, veal, spinach and Panna Cotta with chocolate sauce! Stato della Città del Vaticano (Vatican City)! My next travel post is coming up on Sunday! Have you run out of new stamps to play with? 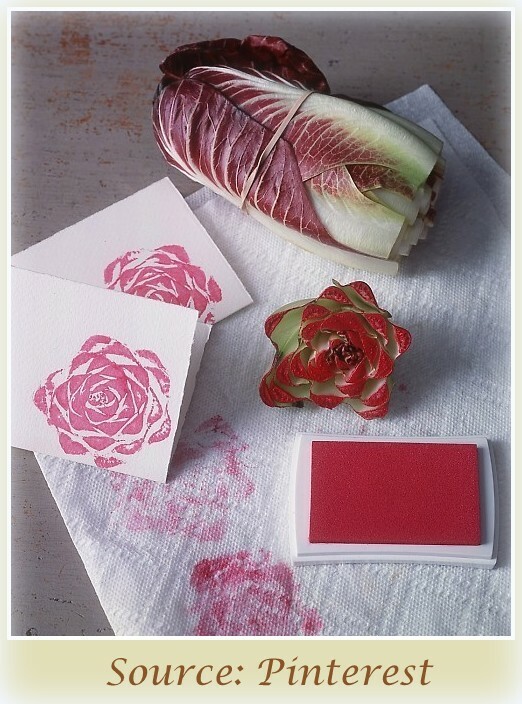 Do you have the URGE to stamp with vegetables?! EVER? Well, I had a little stamping session with nappa cabbage. This is a Pinterest photo that I pinned on my board a long while ago. Thanks to the latest challenge Stamp with a Homemade Stamp over Moxie Fab World, it prompts me to get a stamping session with the vegetables! My photos are pretty self-explanatory. As you can imagine, how much FUN it was to play with the vegetables in the craft room!!! After that, I trimmed off the cabbage to make medium size "flowers"! Aren't these fun? All the sentiment are from CAS-ual Fridays' new stamp set called "Casual Elegance". Ding---> Canson water color paper was used for this project. That way the moisture from the vegetables will not warp the paper and also gives a lovely water-coloring effect! Please note: I used the core part of the cabbage for stamping experiment. The core was not meant to be consumed, thus, there was not a scrap that had gone to waste. I used the stamps (Fresh Bloom) from Neat and Tangled which is the sponsor for this challenge. I don't think I play enough with the color grey. This inspiration prompted me to explore the possibilities. I did some paper-piecing (Basic Grey's Clippings) with the flowers. I must say that I am loving the grey! I chose the silver shiny card stock for the base (not showing too much in the photo). Somehow it seems to have a trendy vibe to it? Ding---> The patterns in the flowers do play a role in this card. 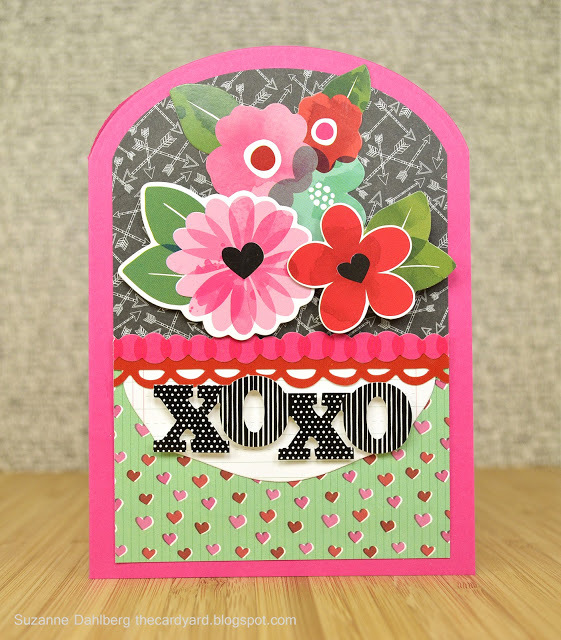 For a monochromatic card, adding a bit of patterns to the mix enhances the overall design! I am trying my hands on putting 10 different embellishments in a project! Here are all details from Moxie Fab World! I was having too much fun playing with the embellishments....I think I added a LOT more than I had set out to do. are in hiding. Try a jar, glass or cup image!? I used all 18 of them (buttons, gems, pearls)! 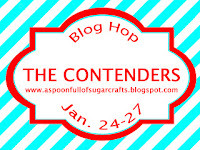 Announcing the winner of my blog candy for the Hero Arts Hostess Blog Hop! I had a feeling you'd be playing with that new stamp! You do silhouettes so well, Virginia! I adore this image and the cards you have made with it. So sweet! Thanks for a great hop today! January 18, 2013 at 2:01 PM Judy, please e-mail me your postal address to me and will send the prize out to you! To give the reject contending card some love, the sweet and talented Annette Witherspoon is hosting The contenders Blog Hop. Kudos to Annette in starting this, so we can share our cards that we worked hard for. Due to the limited space of the publication (at least I'd like to think that), not all cards can be picked. I actually got very lucky in this round since my mojo was a bit low with the call. I only submitted two! And lo and behold, one of them got picked! I submitted this card for the designer challenge-use water. I chose the Basic Grey Paper (Serenade) to match the summery water-coloring effect. The tool that I used for this card is Tim Holtz Detailer Water Brush by Ranger. New feature in my blog: creative light bulb---DING! 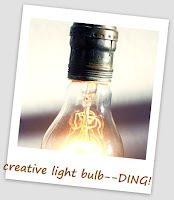 Ding!---> Tim Holtz Detailer Water Brush by Ranger is not a cheap tool ($9.99), but if you have lots of Distress Inks and do not have any/few copics, you may consider acquiring this water-brush. It is a great coloring tool, in my opinion. Last but certainly not the least, thank you so much for the overwhelmingly positive feedback on my travel posts. It seems that you do enjoy seeing them as much as I enjoy posting them! Hello, it's CAS-ual Fridays Challenge time! This week's theme is "Make Your Mark". Basically you will need to use markers in your CAS project! Easy peasy! I created my card with the new CAS-ual Fridays Stamps called "Casual Elegance". I colored the flower with Tim Holtz Watercolor brush with Distress Inks (Worn Lipstick and Tattered Rose). I also brushed the flower with the pearlized water (mixture of Perfect Pearl and water) to give it a shine. Also, we have a design team call for Girl Friday! All the details are here! Please link up your project to CAS-ual Fridays by noon, Thursday Jan. 31, Eastern Time. I can't wait to see how you make your mark! Hello, are you ready to do a little virtual traveling with me? 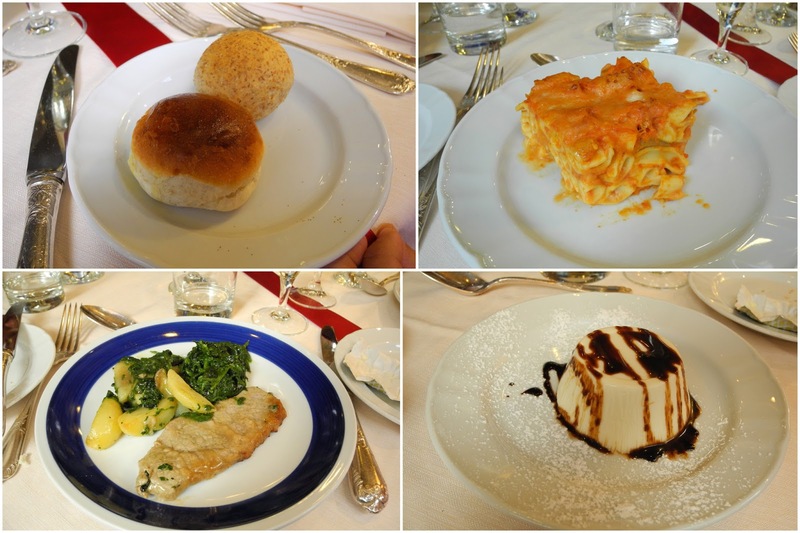 It's time to share my Mediterranean Cruise (part 2). Here is the preview and Part 1 in case you miss seeing the posts. Our destination for the 1st port of call was Livorno. It's a port city on the Tyrrhenian Sea on the western coast of Tuscany, Italy. And that is where the famous Leaning Tower of Pisa is located. That morning my kids and I took a guided tour to the tower. I can't helping posing this photo just like a lot of tourists do! The tilt increased in the decades before the structure was completed, and gradually increased until the structure was stabilized (and the tilt partially corrected) by efforts in the late 20th and early 21st centuries. It was a bit rainy and cloudy that morning...luckily, it didn't rain while we were taking photos. I hope these photos will give you some perspectives about the Leaning Tower. Ready to climb the Tower? The stairs were really really tight and small.The seventh floor was completed in 1319. There are seven bells, one for each note of the musical major scale. The largest one was installed in 1655. The bell-chamber was finally added in 1372. The building of the tower took 185 and 195 years to complete. And the views from the top....it was beautiful! Later that day, I went back with Dr. John and he took this amazing sunset photo. Lastly I came across with this article about sharing vacation photos over FB. In this case, my blog here...it's the LAST thing I want to make anyone feel BAD about not being able to go to these amazing places with my travel photos. If you feel that I am being insensitive about sharing my vacation photos here, please let me know/send me a private e-mail. I will consider not posting them. BUT if that is not the case, please also let me know. In my personal view, I think by sharing the traveling experiences, we are broadening the horizons TOGETHER! We'll be off to Rome next (maybe? let me know!)! Ciao! 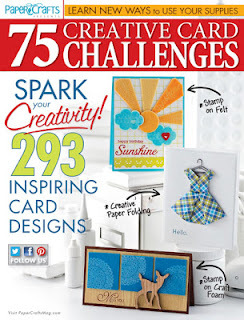 CAS-ual Fridays Stamps New Release!